Well hello and happy Sunday morning to you. 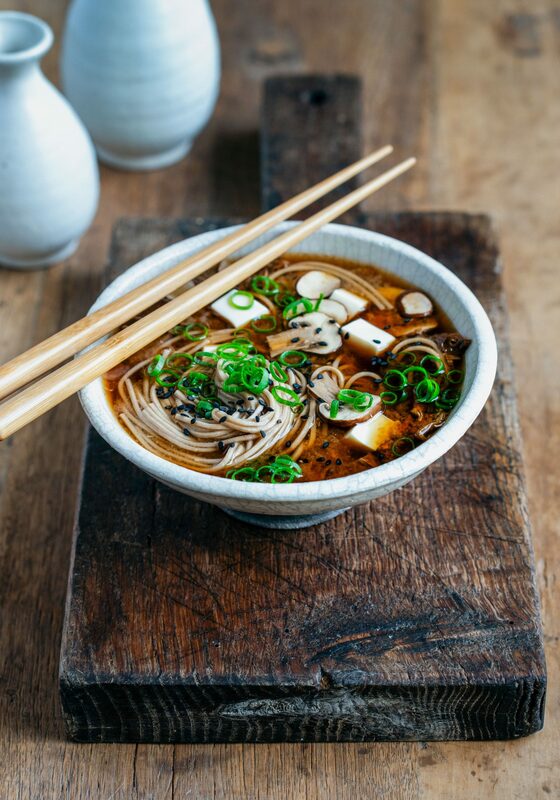 If you have over-indulged over the weekend at all (or even if you haven’t), have I got the perfect Sunday night recipe for you – an earthily, gorgeous mega-umami mushroom and miso soup bowl with silky soba noodles, tofu and bright spring onion. It is ridiculously easy to make and manages to walk the fine line between tasting incredibly rich and satisfying yet it is also spectacularly healthy and light – how is this even possible!? (It is a mystery). You may have noticed the drop-dead gorgeous knife in the second pic…let me explain. If you come here often you will know that I don’t generally do many collaborations or endorsements – up until the last little while it really hasn’t been my gig. However, I was recently approached by the lovely team at Smith & Caughey’s to do some work with them, and it made so much sense that I said yes straight away. They stock the most gorgeous range of kitchenware, appliances, alcohol (with some stunning looking whisky…) and food products – and lucky me I’ll be heading in store at least once a month to fossick around and find things I like (and think you will too), and show them to you! So first up, may I introduce you to the Japanese (no surprises there) Miyabi utility knife. As a cook, I have quite the range of professional knives and even take them with me on holiday as I can’t bring myself to use crappy knives any more (I know, I know). But seriously, I know this is going to sound effusive, Japanese knives are the best, and Miyabi produce the best of the best. Using a knife like this is special, it is like getting out of your jeans and dressed up to go out for dinner, it has an elegance and refinement about it, which just feels so good, (and like the perfect LBD they are an investment piece you can keep and use forever). I am not going to go into screeds of technical stuff, but in a nutshell, the knives are made in the tradition of the ancient Japanese masters with a bit of German ingenuity for good measure. Each blade is made of 101 layers of microcarbide powder steel and features an ornate floral ‘damascus’ pattern. The round handles are made of beautiful pale Masur birch and finished with a mosaic pin. Also. They are bloody, outrageously, fabulously sharp. If you fancy treating yourself (or your mum for mother’s day) head here and check it out on the Smith & Caughey’s website. Put the dried mushrooms and ginger in a bowl and top with the boiling water. Allow this to steep and reconstitute the mushrooms for 20 minutes. Drain the mushrooms and ginger through a fine sieve, reserving the stock. 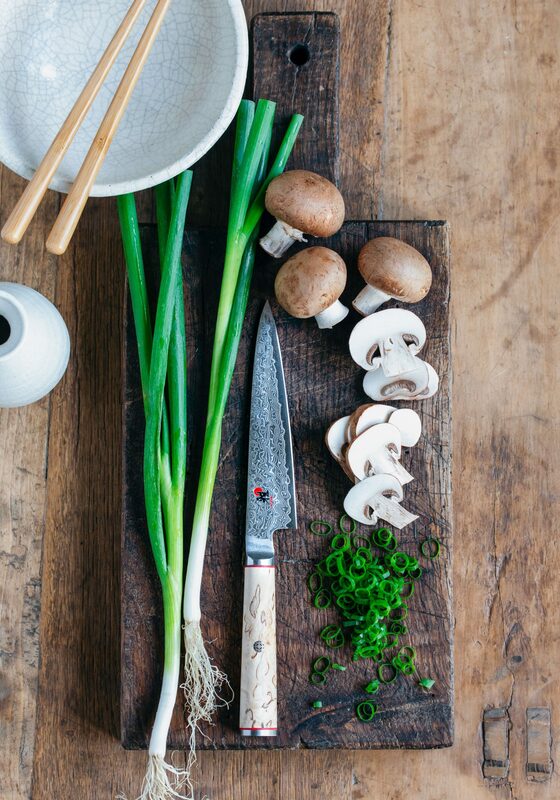 Discard the ginger and chop the reconstituted mushrooms. Put the stock in a saucepan, whisk in the miso and bring to a gentle boil (almost a simmer). 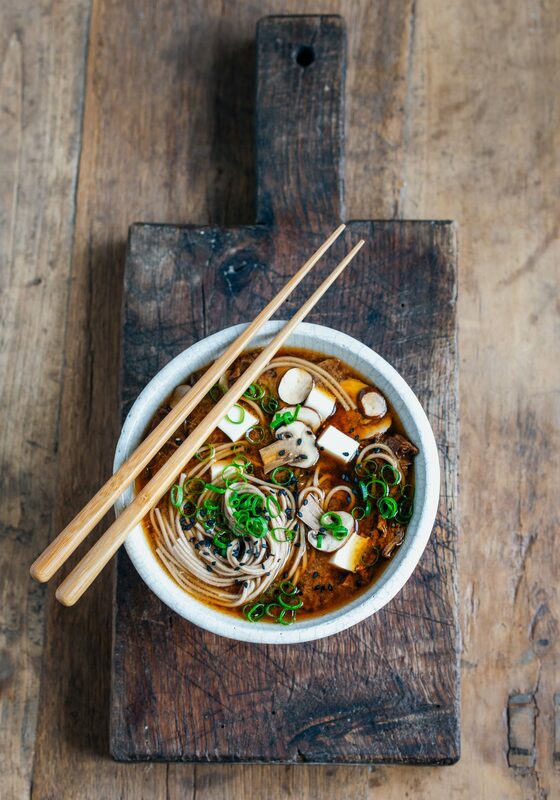 Add the tamari and sliced mushrooms, cook 2 minutes then add the soba noodles and tofu. Cook a further 2 minutes until the noodles are just cooked. Stir through half of the spring onion, then serve immediately garnished with the remaining spring onion and sesame seeds. Too easy.